This Wednesday, Gensource Potash announced it had signed an asset purchase agreement and term sheet for an offtake agreement with Yancoal Canada Resources, a move that ties directly into the company’s vertical integration strategy. This Wednesday, Gensource Potash (TSXV:GSP) announced it had signed an asset purchase agreement and term sheet for an offtake agreement with Yancoal Canada Resources, a move that ties directly into the company’s vertical integration strategy. The agreement includes the purchase of two potash exploration permits, conditional upon their conversion into mining leases, for a purchase price of $2,480,000 payable in two installments. The projects lie fairly close to Gensource’s Lazlo project, and is hosted within the same geological structure. No doubt, that could potentially be a boon for project development. However, for Gensource president and CEO Mike Ferguson, it’s the term sheet for an offtake agreement that’s more exciting. “The offtake agreement is actually a more valuable item in the long term than the actual assets are, we believe,” he said in an interview with the Investing News Network. As mentioned in Thursday’s release, Gensource is focused on ensuring that any product is “pre-sold” before it develops a potash project to any great extent. Thursday’s agreement includes a term sheet rather than an actual offtake, but Ferguson noted that the agreement is conditional on the two companies negotiating a formal offtake agreement within the closing time frame. As Ferguson explained, an offtake agreement could be a potential benefit to Yancoal as it moves to establish itself in the potash business. “Yancoal has a very large land position in Saskatchewan, and they are currently creating their own project,” he said, referring to the 2.8 million tonne per year Southey potash solution mine. Right now, Yancoal is currently building out its potash business to market its product. Ferguson stated that while Gensource hasn’t completed a full offtake for the Lazlo project yet, the company is working with separate groups in Brazil and India to get to an agreement. Ferguson added that the company hopes to publish a prefeasibility-level study for the projects in mid to late summer. Shares of Gensource were up 11 percent on Thursday to $0.05. Roughly 217,450 shares of the company traded hands, higher than its 173,739 daily trading average. Gensource has a market capitalization of 7.65 million and has traded within a 52-week range of $0.04 to $0.07. 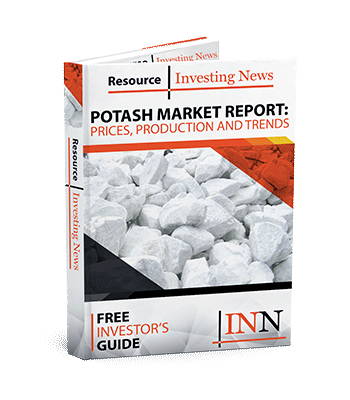 Editorial Disclosure: Gensource Potash is a client of the Investing News Network. This article is not paid for content.